China’s magnificent new walkway is giving people a treetop experience of Fuzhou’s sub-tropical forests unlike any before. 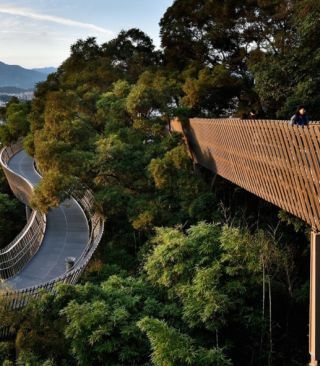 Singapore-based LOOK Architects recently completed the first phase of the Fuzhou Forest Walkway, a snaking treetop walkway that will span over 19 kilometres at completion. The elevated pedestrian pathway looks like a dragon’s back threading down the lush Jinniushan mountain and offers urban dwellers the chance to reconnect with nature and brings attention to one of the city’s quickly diminishing green lungs. Covered in greenery thanks to a sub-tropical climate, Fujian’s capital of Fuzhou is one of China’s greenest cities and is famous for its numerous banyan trees that line the streets. LOOK Architects’ Fuzhou Forest Walkway brings nature closer to the city with an elevated path that covers the full breadth of Jinniushan mountain and offers beautiful views of the canopy, the city, and mountains beyond. The walkway can be accessed via 10 different entrances, each with unique and eye-catching features such as the grand 24-metre-wide spiral ramp at the entrance of the existing Jinniushan indoor sports hall. Built with a gentle gradient, the elevated walkway is punctuated with amenities that include rest shelters, viewing decks, observation towers, and teahouses with bathrooms. The structure is also equipped with WIFI connectivity, touch-screen information boards, and visitor traffic monitors, giving the project the potential to set a new bar for China’s eco-routes. Copyright 2004-2019 © Innovatek Ltd. All rights reserved.